Data analytics is the art of analyzing raw data by using quantitative and qualitative techniques and procedures for the purpose of drawing conclusions from the data. For better business decisions, companies make use of data analytics. Data analytics has moved from being just descriptive such as reports, to predictive, predictive modeling, offering statistical analysis, planning for future scenarios, and optimization and forecasting for anticipation. Outsourcing of data analytics provides more flexibility to companies. It also allows companies to use updated tools and have expert opinion on their data. Outsourcing providers offer services that they specialize and excel in. As it is their main business, the providers ensure their service meets global standards. Outsourcing providers offer both vertical and horizontal solutions packed in a variety of configurations. Data analytics spans a wide range of techniques, toolsets, vertical specific expertise, and services. Outsourcing vendors have become more sophisticated as they handle complex projects and datasets. The market for data analytics outsourcing is projected to be valued at US$ 20,681.1 Mn by 2026, recording a CAGR of 29.4%. Various industries can benefit from data analytics, especially financial services, healthcare, media, communications, and retail. The retail industry can now find opportunities for new products and profit based on market trends that can be researched digitally through observing consumer behavior over social media and their engagement and buying experiences, without going through the traditional ways such as interviews and surveys. Instead of having an in-house software, companies are looking for outsourcing their research to a third party so as to save on costs. The BFSI sector drives the data analytics outsourcing industry with most of the companies targeting this vertical. However, emerging verticals such as manufacturing, healthcare, and IT & telecom also are showing high growth in this market. Exponential growth in data generation has increased the need for advanced data analytics skills to leverage the same for business benefits. Enterprises are increasing profitability and improving their efficiency by using several business software systems such as customer relationship management (CRM), enterprise resource planning (ERP), and supply chain management (SCM). These systems have resulted in an exponential increase in data related to operations, customers, and suppliers. Increased pressure for regulatory compliance and greater transparency in sectors such as BFSI, healthcare, and IT & telecom are expected to increase the demand for data analytics. Inadequacy of in-house expertise has led to higher demand for third-party service, allowing the enterprises to make effective insight-driven business decisions, provide improved services to customers, and avoid losses and risks. With rise in awareness regarding its advantages and increase in productivity through its use, and also due to lack of in-house expertise and skilled resources, the data analytics outsourcing market is anticipated to grow swiftly in the near future. However, many organizations are reluctant to outsource their data analytics service due to concerns regarding data security. For regulated industry sectors such as banking, insurance, healthcare, and government, security of data is crucial and any failure or gap in it may result in major problems. These may lead to circumstances in which the analytical models can impact on privacy negatively from both an ethical and legal perspective, and hence signify the possible hindrances to the data analytics outsourcing market. A key trend boosting the growth of the data analytics outsourcing market is the popularity of Internet of things (IoT) as it provides marketers and businesses with opportunities to utilize and create actionable insights regarding consumers. The new technologies vital for successful implementation of IoT drive new business opportunities. Data analytics is swiftly developing as Internet of things (IoT) is helping in better decision making. Analysis of information about connected things is one of the key features of Internet of things. Usage of IoT increases the amount of data in category and quantity, thus presenting the opportunity for development and application of data analytics outsourcing. The data analytics outsourcing market can be segmented on the basis of application and industry. Based on application, the data analytics outsourcing market can be classified into marketing analytics, sales analytics, fraud detection and risk management, supply chain analytics, process optimization, advisory services, device security solutions, and others. Based on industry, the data analytics outsourcing market can be divided into BFSI, IT & telecom, healthcare, retail, media & entertainment, energy & utilities, hospitality, education, manufacturing, consumer packaged goods, and others. From a geographical standpoint, North America is expected to hold a major share of the data analytics outsourcing market. Growth of the global data analytics outsourcing market in the region can be attributed to the rising demand for advanced data analytics services in industries and the high adoption of marketing analytics by companies as to offer the best possible services to their clients. Asia Pacific is expected to witness lucrative growth as rapid progress is projected for the data analytics market in India. Furthermore, the data analytics outsourcing market in Asia Pacific, Europe, Middle East & Africa, and South America is also expected to grow significantly during the forecast period. The data analytics outsourcing market is largely driven by mergers and acquisitions. For instance, in June 2017, Fractal Analytics acquired 4i Inc., a Chicago-based analytics company. The acquisition is projected to enable Fractal Analytics offer its services in a more strategic manner. In August 2017, Accenture acquired the data analytics company called Search Technologies. Search Technologies has developed specific unstructured data normalization technologies that Accenture plans to combine with its AI and data analytics capabilities. The acquisition is expected to help Accenture deliver better customer experiences and business outcomes. Vendors in the data analytics outsourcing market offer highly advanced and customized products to strengthen their market presence. The other leading strategies in the market include new product launch; for instance, in January 2017, Mu Sigma launched Meta-software, a new analytical software in order to provide customers with flexible and effective solutions. 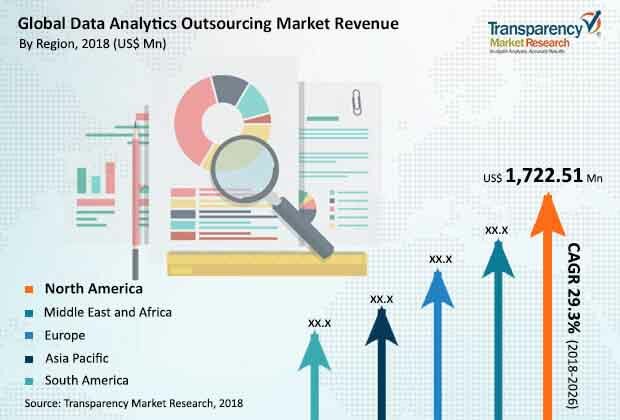 Key players profiled in the data analytics outsourcing market report include Accenture, Capgemini, Fractal Analytics Ltd, Genpact Ltd., IBM Corporation, Infosys Ltd., Mu Sigma, Inc., Opera Solutions LLC, RSA Security LLC, Sap SE, Tata Consultancy Services Ltd., ThreatMetrix, Wipro Ltd., and ZS Associates, Inc.